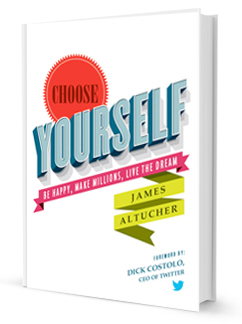 I do not know how I came across James Altucher first. It was definitely not by word of mouth though I wish I had discovered him earlier. My hunch is that I came across him via Twitter though I cannot be sure. He has written many books but I first stumbled upon his book Choose Yourself a few months ago and it remains one of the best books I have read about oneself if not the best. To put everything into perspective, I subscribe to countless newsletters which i receive on a daily or weekly basis in my mailbox. Most, unfortunately end up not being read because of lack of time. Worse, many end up in the trash can even before they are opened. But those by James Altucher are different. There are always interesting insights and nuggets of wisdom which make you stop to think. Choose Yourself is a fantastic book no matter in which situation you find yourself. Whether you are in employment, in business, in between jobs or careers, thinking about setting up a business or else unemployed, Altucher strikes many chords and makes you think first and foremost about yourself and what you want to be. He is blunt and says things which others might find difficult to speak about. One of the most important lessons that I have taken from this book is to try and generate 10 ideas on a daily basis. Sit down, do it once, do it twice and you realise that generating 10 ideas a day, sometimes even 10 ideas a week is not as easy as it sounds. What Altucher however insists on is simple. Once you discipline yourself to writing ideas, you become an idea generator in whatever situation you find yourself in. When you look back at your ideas after a few weeks you can start to connect the dots and build connections which lead you to many executable ideas. This blog came about from this idea generation. It has been on the back burner for I don’t know how many years but the problem with ideas is that unless you execute them, they remain ideas. So despite the fact that I have a busy day job and two young children, I have managed to carve some time to build this blog by writing every evening. Once this becomes a routine, it becomes so much easier. It is the same with exercise. How many times do we procrastinate about exercise. But once it becomes part of your daily or weekly schedule, then it becomes easy no matter how bad the day is. I read at least a book a week and I have found that in the case of this book, I end up recommending it to friends time and time again irrespective of the books I read in the meantime. You can read about James Altucher on his website but he is a successful entrepreneur, chess master, investor and writer. His next book is “The Power of No”. Having seen his blogs, I am sure that he has a lot to say about this topic. These are a few extracts from the book I have highlighted. Rejection – and the fear of rejection – is the biggest impediment we face to choosing ourselfs. What you need to do is build the house you will live in. You build that house by laying a solid foundation: by building physical, emotional, mental and spiritual health. Only do things you enjoy. Spiritually we need to recognise the importance of wanting less in our lives, to the point that we want to disappear. If you think you can do something, if you have confidence, if you have creativity (developed by building up your idea muscle), the big ideas become smaller and smaller. Write down ten ideas. About anything. It doesn’t mater if they are business ideas, book ideas, ideas for surprising your spouse in bed, ideas for what you should do if you are arrested for shoplifting, ideas for how to make a better tennis racquet, anything you want. Ideas are a dime a dozen. It’s all about execution. Disclaimer: I read an e-book version of the book which I purchased myself. Ivan Brincat Blog at WordPress.com.